Review Summary: Creating a unique sound, Gojira fuse several genres and generate a relentlessly heavy extreme metal album. Gojira are an extreme metal band from Bayonne, France that combine several genres, most prominently death metal and progressive metal, to form their own type of extreme metal. The Way of All Flesh is their magnum opus, presenting their most mature album, both lyrically and musically. 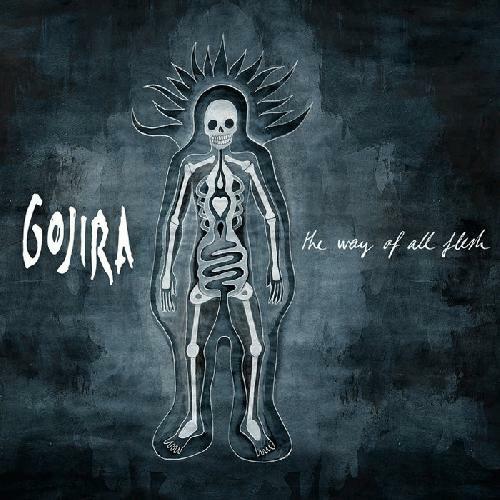 Many elements of Gojira's music make this album unique. They play heavy, crushing riffs, yet will also play melodic riffs, sometimes combining the two. Melodic riffs appear throughout the album, notably on the songs Oroborus and The Silver Cord. Most of the riffs are tremolo picked, often accompanied by blazing fast blast beats and double bass from the drums; yet on songs such as A Sight To Behold they will play much slower, with a style akin to groove metal. Progressive metal is evident throughout the album, with many different time signatures and constantly-changing riffs. Most of the band members give amazing performances on this album. Joe Duplantier and Christian Andreu, the band's guitarists, use unique effects with their guitars that help to differentiate Gojira from other metal bands. Their pick slides and pinch harmonics sound very unique, one of the first things that will stand out to someone listening to this album for the first time. Unfortunately, Jean-Michael Labadie's bass is very low in the mix, and is only heard in some less heavy parts of the album. Joe Duplantier's growled vocals are heard and understood more clearly than most death metal vocalists, and definitely fit perfectly with the music. One of the high points on the album is Adoration For None, which features Randy Blythe from Lamb of God on guest vocals. The "duet" between the two clearly shows their vocal prowess. The best performance of any of the band members is given by drummer Mario Duplantier. Throughout the album, he plays with lightning-fast double bass and blast beats, while also showing rhythmic expertise. Perhaps his greatest show of skill is the song Yama's Messengers, in which he alternates between blast beats and snare triplets at several points in the song. Lyrically, this album stays with the ecological themes found on From Mars To Sirius, but not in the concept album form. Many of the songs speak of how humans are destroying the planet, even referencing the Pacific garbage patch in the song Toxic Garbage Island. Several of the songs deal with death, however, and how it is a part of life. These lyrics spoke to me personally and are an often overlooked aspect of this album. Overall, this is a superb album. It combines melody, heaviness, and progressive songwriting perfectly to form a unique sound not found in metal today. While some might be turned off by the albums length, it rarely gets repetitive and boring, a problem found on From Mars To Sirius. This is album introduced me to death metal, and should be listened to by any extreme metal fan. Any constructive criticism is welcome, but please don't neg this right away. "This is my very first review, so try to go easy on me." Not sure if you can call a band's latest album its magnum opus. Excellent review. Don't see why a lot of people don't like this. "While some might be turned off by the albums length, it rarely gets repetitive and boring"
Definitely an overlooked and underappreciated band on this site, great review too! Thanks for the positive comments guys, I was expecting everybody to hate me for liking this band. Why do people dislike Gojira? There isn't much reason for it. i love this. sue me. i can see it's glaring faults though, hopefully their next album is more streamlined. sadly it ain't coming any time soon, they said they were all taking a minimum 6 month hiatus following their most recent tour. soooo, darth vader was luke skywalker's father all along? Saw this band live with In Flames. Impossible to not headbang to the riffs until you have whiplash. This and From Mars to Sirius are almost equal. Toxic Garbage Island is awesome plus I like the production on this album.